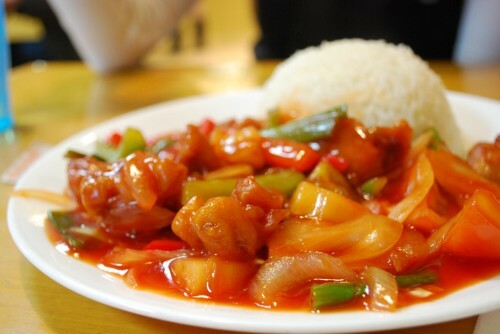 This delicious Sweet and Sour chicken with its tangy twists will amuse your taste buds as the sauces fuse together to create the distinctive flavor. It especially comes to the rescue when you want a dish cooking by the side as you focus on preparing main courses. It is best served with boiled rice, but you may also add variation with dinner rolls. Mix together all the sauces, pineapple juice and seasonings well till combined. Coat chicken with the mixture and place in the slow cooker. Add onion, green bell pepper, and pineapple to the crock pot. Cook for half an hour. Dissolve cornstarch in water and slowly pour and stir into the chicken. Serve with boiled rice or dinner rolls.